Formed after Korbin the Mad began his life in Arnor, House Dunamai is a relatively small but tightly-knit sect formed around the Dunamai family. Although some members of what is considered the family are not related, Korbin believes they are related in their madness; he professes that madness is a blessed disease, and that all the world must be infected to be righteous. He has made his mission, as well as the mission of House Dunamai, to spread madness across the world through various means. The House crest differs. 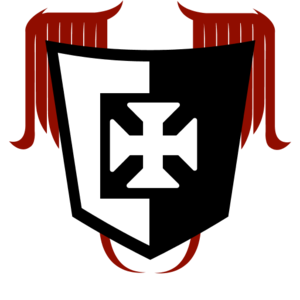 It is simply the iron cross, in the purest of white, beset on a black square atop a vertical split of black and white. It shows the balance of all things valued-- virtue, honesty, dignity, honor-- with all that compromised those things for practicality, which Korbin believed to sometimes be necessary, without forsaking faith in one another, in one's self, or in one's god. The members of House Dunamai are seperated into three categories. The family, which is the core of the House; the Ordinators, who are the warriors that fly the House banner; and the Charges, who are non-combatant members that serve in other facets of life. Emmisaries are members who have been granted the ability to gather other members under the banner of House Dunamai without the recruits knowing the Family. Lord Korbin Arhantas Dunamai the Mad, "The Mad Lord"
Currently, as per the decision of Lord Korbin the Mad, House Dunamai is committed to Arnor under fealty of High King Angmarth. But Korbin does not forget his roots, and also feels loyalty to Sir Peregrine and Muxlovia. This page was last modified on 13 April 2014, at 19:51. This page has been accessed 8,621 times.